AI, AI, AI, drones are using sight to fly! Scientists in Zurich are removing the blinders and letting drones figure things out for themselves. 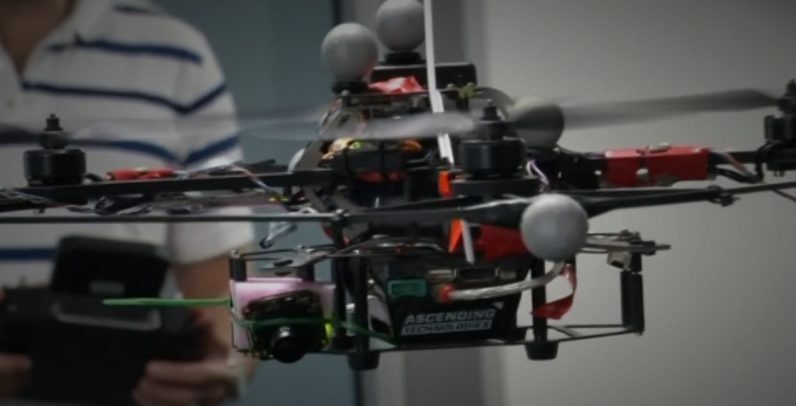 Using “vision algorithms” a group of researchers were able to teach inexpensive off-the-shelf drones to fly autonomously and map surrounding areas. The algorithms used are a “dense surface reconstruction” data-set designed to teach drones to understand their environment. Using a single camera and an inertial sensor the drones are able to take off, navigate, and create accurate 3D images. We start off with zero knowledge about where the drone is. The pilot clicks a button so that the drone takes off, as soon as the autonomous mode is on the drone starts perceiving its environment, it starts building a map of its visual landmarks on the goal, and judging how these move – how these landmarks move – from one image to the next. Then the drone is really reasoning about its motion; essentially the motion of the camera. This technology allows drones to operate without people, the ability to build 3D maps in realtime will aid navigation and allow the robot to plot courses through cities, forests, and even over water. It’s almost certain that the future of search and rescue involves autonomous drones. The researchers also showed off the algorithms’ ability to direct devices, allowing one to find a group of people who were eagerly awaiting lunch – and deliver them a pizza. The next time you see a quadcopter in the sky, don’t be so sure there’s a person somewhere controlling it.